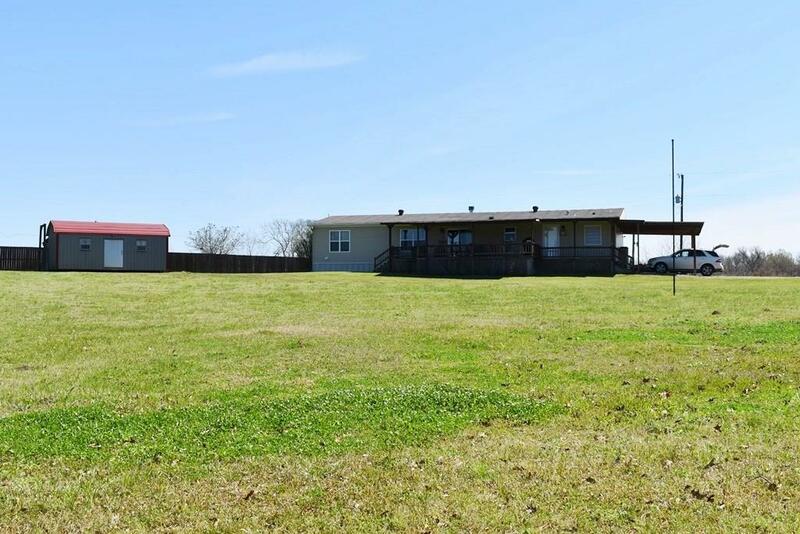 Custom home on 2.14 acres less than 6 miles off I-49. Spend your evenings looking at the countryside on your huge, ap 500 sq ft covered front porch with shades. This 2011 double-wide home features open kitchen/dining/living with a fireplace and sliding door to porch, separate living room with wet bar for additional entertaining space. High end cabinets and flooring in this kitchen with large island, stove, dishwasher, refrigerator. Master suite has ample space for a king sized bed, walk in closet. Master bath has huge soaker tub, 4' shower, two sinks. Three bedrooms and full bath on the opposite side as master. Rear door with covered porch leads to fenced dog yard. Utility room with room for second refrigerator leads to 16' x 30' covered carport. 12' x 24' storage building with attached 11' x 24' shed. Yet another 16' x 24' covered shed for boats, mower, 4-wheelers, etc. This home has 2x6 studs and energy efficient windows. AC compressor is one week old. Priced to sell. Directions: I-49 To Cypress/Flora Exit. Hwy 120 West For 2.9 Miles. South On La Hwy 478 1.3 Miles. Left On Paige Hill Rd 1.7 Miles. Home On Right Side Of Road. Look For Signage. Arrows Posted At Hwy 478 And Page Hill Rd.